Recently, WeAreTeachers posted an infographic from the Learning Policy Institute which addressed many of the frustrations and issues teachers are dealing with in today’s education culture. 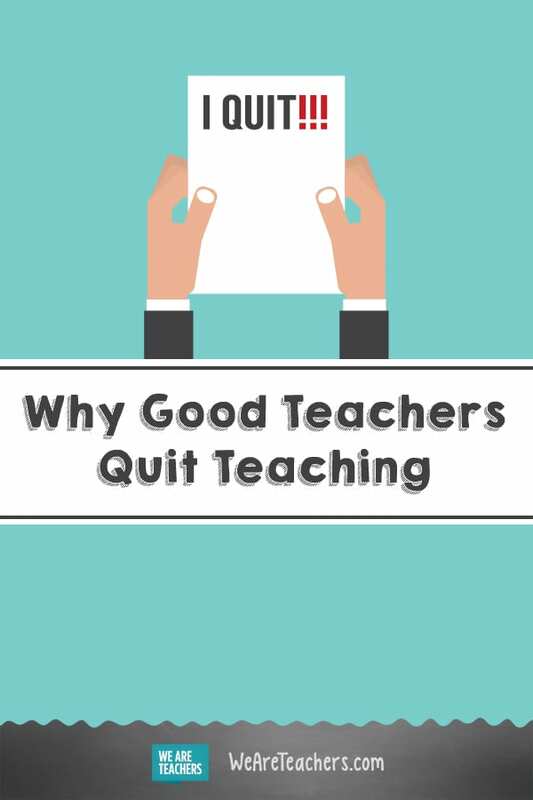 The infographic illustrated the top reasons cited as to why teachers quit the profession. The topic definitely struck a chord with our readers. We received an overwhelming amount of feedback to the post, with teachers sounding off on issues from challenging physical and emotional work conditions to health and personal reasons. According to one 2017 survey of nearly 5,000 teachers conducted by the AFT and BadassTeachers, nearly two-thirds feel their jobs are “always” or “often” stressful—roughly double the rates of stress experienced by the general workforce. Many teachers feel the negative effects of what they perceive as a lack of respect. A recent report from Penn State University and the non-profit Robert Wood Johnson Foundation, claims among professional occupations, teachers rate lowest in feeling that their opinions count at work. The demands teachers are feeling as a result of high-stakes standardized testing and the emphasis on data collection is definitely a hot button issue among teachers who are leaving. According to an NEA survey of classroom teachers, 72 percent replied that they felt “moderate” or “extreme” pressure to increase test scores from both school and district administrators. What do you say, educators? 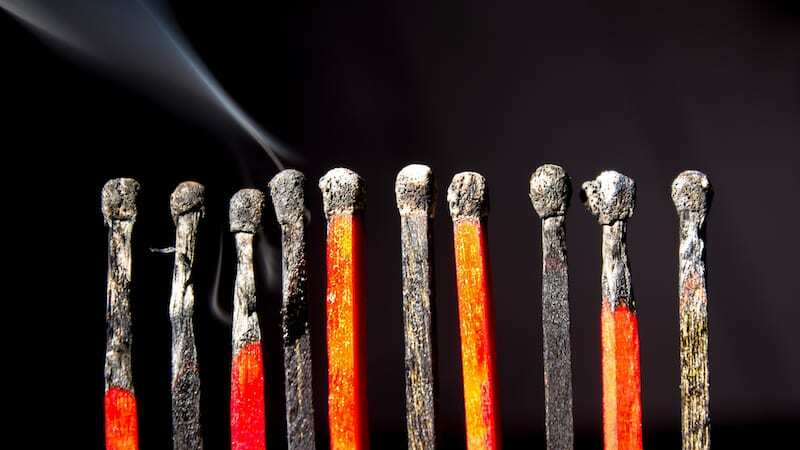 What do you think are the biggest reasons why teachers quit? It may well fall under support and respect, but I and my fellow teachers see children’s and parents’ behavior as abominable. We have no recourse and the kids know it. And if you so much as cross your eyes at a child, they (kids or parents) call the police and school board. 10 year olds hold my career in their hands. It’s ridiculous. I was a teacher of 35 years. As the owner as well as one of the teachers of a private lower grades elementary school I agree with the writing above. I see it from both sides. I agree with Mary Mann that the lack of respect is the number one reason why we quit. This is why I shut my school down and quit teaching all together. We taught at a higher level and far more than the public schools teach. We were bombarded with state requirements. Students and parents put us at great risk everyday and it is not all students, however, way too many. Be it their attitude, lack of cooperation, physical attacks on us, shootings that could happen at anytime or the yelling at us, we put up with a lot. Parents only want to be their child’s friend and take on no parental responsibilities. Parents do not seem to be accountable. Now add the list above to this and why would we stay? We would be fools to stay. My teachers received good pay but the state requirements over worked them however, more over, parents don’t pitch in and students do not cooperate. Now if the pay is low and your life or reputation or nerves/health are at risk why should we stay. It comes down to this. Restructure the requirements, PAY MORE, turn on the air conditioner/heat buy the supplies for all the teachers, teach to all students and make the parents accountable and the work load reasonable. Cut down on the meetings, the principal should be putting thing in place not the teachers. The teachers are busy grading papers. For goodness sakes my teachers were not over loaded with work my preK students at the end of the year completed first grade and knew at least a little on how to communicate in 2 different foreign languages. They read and read well, did math, geography, history, science and then moved on to first grade. The parents who did not take on their part had pay for me to hire a tutor. No one is doing their job for them. Public school needs funds for this as well. Tests were exactly that, test to better rank a student among the other students in the state. Mine were always ranked high. So it can be done but not the way the states want it done. They are unreasonable and ridiculous. What you are going to be left with at the end of the day are teachers who are desperate for their jobs and don’t do it well. I’d rather have happy teachers who wanted and loved to teach and, therefore, students who learned at a high level. Also students are being taught at the wrong age. An hour a day, five days a week, is all I needed to teach a three year old math, reading, language arts and so much more. These teachers would not be struggling if preschools knew how to teach as my teachers did. So many of my students won scholarships for college and went on to very successful jobs. The reason why? My teachers never had to rush and weren’t burnt out on teaching and therefore the students never struggled. Learning was always fun and manageable for them. It’s just not hard. Now let’s change the ones with bad attitudes and reorganize the curriculum, paperwork and expectations. Put the expectations on the parents as I did. It’s their job. and increasingly poor pay and fewer benefits. These five so very concisely cover everything! I can’t think of a 6th! This is year 31 for me. I spent 28 years as a classroom teacher and these last three as a librarian. Getting out of the classroom was the best thing for me. The nonsensical testing and the collection of data is such a waste of time. Teachers go into the profession with the intention of helping kids, not doing to testing to justify their jobs. Now I get to spend time with students and I do not have the foolishness that goes along with being in the classroom. 1. Schools are now head-count driven for money. This has made an environment of keeping kids at school, at all cost. Usually, to teachers becoming babysitters to unruly , unmotivated students and criminally charged students with parents that don’t give a d__n. Just as long as they get them out of the house with them. Kids are being used more so like cash-cows. 2. In the meantime officials at the school board are giving themselves salaries ranging anywhere from $50,000-$100,000 a year. While, teachers are struggling to live halfway decent on mediocre pay, by maintaining second jobs. 3. There’s no repercussions to students, or responsibility for parents anymore for their children’s education and behavior. It’s always the teacher’s fault. 4. Teachers are being placed in very very dangerous situations. 5. Teachers are asked to be certified by having to take very expensive test, that they can’t afford. Now you’re going to bring in foreign Teachers? Have they been tested. 6. The educational system has become a joke. We are not preparing kids to be successful or compete in the real world. Ooops, I said it!! This cuddling of parents and students is criminal. Therefore, any real teacher in good conscience could not stand by and watch Americans kids become the dumbest in all the industrialized countries. They would rather go work at WALMART. P.S. OF COURSE THIS DOESN’T APPLY TO EVERYONE. BUT, THE PERCENTAGE THAT IT DOES APPLY TO IS TOO GREAT. IT HURTS ME TO MY HEART TO SEE THIS. QUESTION:How did my mother, in a school that was a church on Sunday, in the woods, get a better education than kids are now with all this modern technology?? Teachers are not given the time necessary to adequately prepare for instruction. We are bogged down with meaningless, paperwork. We don’t even have time to grade students’ work. It get worse every year. Meanwhile these lawmakers and school leaders are patting themselves on the back, thinking they’ve done a good job, but all the while only making matters worse because they never address the real problems. To make matters worse, new teachers think this is just the way it is and submit to these terrible policies, and veteran teachers retire and are glad not to deal with it, so there aren’t enough teachers speaking out against the insanity that has become public education. To say I’m concerned for our country is an understatement. As a teacher for 38 years in Special Ed. sees that students and parents have more rights than teachers. Students and parents can accused teachers of stuff(which was NOT true) and then tell admin that “The teacher will not discuss what they said happen with their child). I felt as I was never given the opportunity to speak with parents and student. I was never heard. The districts will take the parents/students word over the teacher without doing an investigation.I asked for an investigation to be held in my case but none was held. I loved teaching and I know that there are a few students/parents out there that do respect the teaching profession. It’s my time to step down and pray for all teachers. The saying “One bad apple can spoil the whole bunch” is true. My love for teaching has been spoiled!! This is so spot on. I’m not sure if I should feel better because I feel validated or worse because our educational system is in crisis. I have been a teacher more than 1/2 of my life and I’d have to say I have seen a lot. But I know nothing. I have seen so many new administrators come and go and the one piece of advice I want to give is look at the history of the system. Ask us who have been in the trenches! What’s been tried? How did that work? Use the damn data! Let’s not repeat what doesn’t serve the students or the system. I also have to agree that this is one of the most disrespected positions to be in…from needing Doctor notes because they don’t believe you have an appointment or are sick to all the wasted time in meetings, meetings, meetings. We are no further along because we meet quadruple the time we used to meet. I am so excited to be ending my career because I know I have more to do on this Earth. But man will I miss those kids. I agree with many of the add-ons from students not learning anything but teach-to-tests idiocy but my foremost reason was lack of administrative-down effective discipline… uh, lack of any discipline at all. All attempts to discipline students were trashed and students virtually rewarded! I was a teacher for 35 years. As the owner as well as one of the teachers of a private lower grades elementary school I agree with the writing above. I see it from both sides. I agree with Mary Mann that the lack of respect is the number one reason why we quit. This is why I shut my school down and quit teaching all together. We taught at a higher level and far more than the public schools teach. We were bombarded with state requirements. Students and parents put us at great risk everyday and it is not all students, however, way too many. Be it their attitude, lack of cooperation, physical attacks on us, shootings that could happen at anytime or the yelling at us, we put up with a lot. Parents only want to be their child’s friend and take on no parental responsibilities. Parents do not seem to be accountable. Now add the list above to this and why would we stay? We would be fools to stay. My teachers received good pay but the state requirements over worked them however, more over, parents don’t pitch in and students do not cooperate. Now if the pay is low and your life or reputation or nerves/health are at risk why should we stay. It comes down to this. Restructure the requirements, PAY MORE, turn on the air conditioner/heat buy the supplies for all the teachers, teach to all students and make the parents accountable and the work load reasonable. Cut down on the meetings, the principal should be putting thing in place not the teachers. The teachers are busy grading papers. For goodness sakes my teachers were not over loaded with work my preK students at the end of the year completed first grade and knew at least a little on how to communicate in 2 different foreign languages. They read and read well, did math, geography, history, science and then moved on to first grade. The parents who did not take on their part had pay for me to hire a tutor. No one is doing their job for them. Public school needs funds for this as well. Tests were exactly that, test to better rank a student among the other students in the state. Mine were always ranked high. So it can be done but not the way the states want it done. They are unreasonable and ridiculous. What you are going to be left with at the end of the day are teachers who are desperate for their jobs and don’t do it well. I’d rather have happy teachers who wanted and loved to teach and, therefore, students who learned at a high level. Also students are being taught at the wrong age. An hour a day, five days a week, is all I needed to teach a three year old math, reading, language arts and so much more. These teachers would not be struggling if preschools knew how to teach as my teachers did. So many of my students won scholarships for college and went on to very successful jobs. The reason why? My teachers never had to rush and weren’t burnt out on teaching and therefore the students never struggled. Learning was always fun and manageable for them. It’s just not hard. Now let’s change the ones with bad attitudes and reorganize the curriculum, paperwork and expectations. Put the expectations on the parents as I did. It’s their job. Thank you for this post and for all the comments. My research on this topic squares with much of what I have read here. My new book, THE TEACHER EXODUS: REVERSING THE TREND AND KEEPING TEACHERS IN THE CLASSROOM, covers the concerns posted above. I thought I would let others know that fellow teachers, myself a 38-year classroom veteran, is trying to bring attention to the issues and find some semblance of resolution. Please feel free to view my professional page at drerniezarra.com. Here is the link to one of my upcoming book releases through Rowman & Littlefield. Thanks for yout time.